Charlotte Perriand is among the foremost figures in twentieth century interior design. Together with her contemporaries and collaborators Pierre Jeanneret and Le Corbusier, she created many pieces of furniture we now consider classics, including the instantly recognizable LC4 chaise. Her pioneering work with metal was particularly instrumental in paving the way for the machine-age aesthetic popular throughout the 1920s and ’30s. The second volume in a planned four-part series, this lavish book covers the years between 1940 and 1955. Beginning in the 1940s, Perriand traveled extensively in Japan by invitation of the Japanese government with whom she worked as an advisor to modernize the country’s design. During this period, she took many photographs documenting traditional Japanese culture, many of which are published here for the first time. From 1952 to 1955, a fruitful collaboration with the Ateliers Jean Prouvé provided for the first time the technical means for Perriand to mass-produce her designs while also further improving Prouvé’s own work both aesthetically and practically. A number of emblematic masterpieces came about as a result of this collaboration, including the Tunisian and Mexican dormitories at the Cité internationale universitaire de Paris. 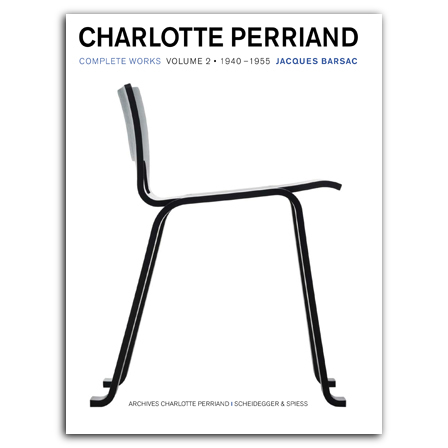 Covering these important moments and many others, including Perriand’s work in Vietnam, in founding the Formes Utiles movement, and in further collaborations with Le Corbusier and Pierre Jeanneret, Charlotte Perriand continues the three-volume exploration of this key figure, complete with annotations and a bibliography for further research. is the rector of the Royal College of Art in London. He has before been Director of the Design Museum London (1993–2001) and of the Cooper Hewitt, the Smithsonian Design Museum in New York (2001–2009).